Tomorrow afternoon Harvard will attempt to begin its Cinderella story against Cincinnati in lovely Spokane, powered by an experienced squad and a very high three point percentage of .390, good for 22nd in the nation. Cincinnati is the decided favorite, all things considered, and when playing against a Goliath situation, it pays to use David, or high variance, tactics. The three point shot is the highest variance shot in basketball, so wisdom would suggest that teams who shoot well and often from beyond the arc are more likely to produce upsets come March. Indeed, Giantkillers of ESPN consider it part of their ‘secret sauce’ when predicting the tournament. However, looking at recent first round games, it is not clear this wisdom holds up empirically. I considered 11-14 seeds in first round games dating back to 2007 (the last year for which HSAC has data from Team Rankings), giving me a sample of 112 games, and compared their performance to their three point shooting profile. I defined performance as the degree to which game win probability, from the log5 formula, was over- or underachieved. This attempts to control for strength of both favorite and underdog. Thus a very large underdog winning is a large positive performance, whereas a minor underdog winning is a small positive performance, and vice-versa for losing and negative performance. 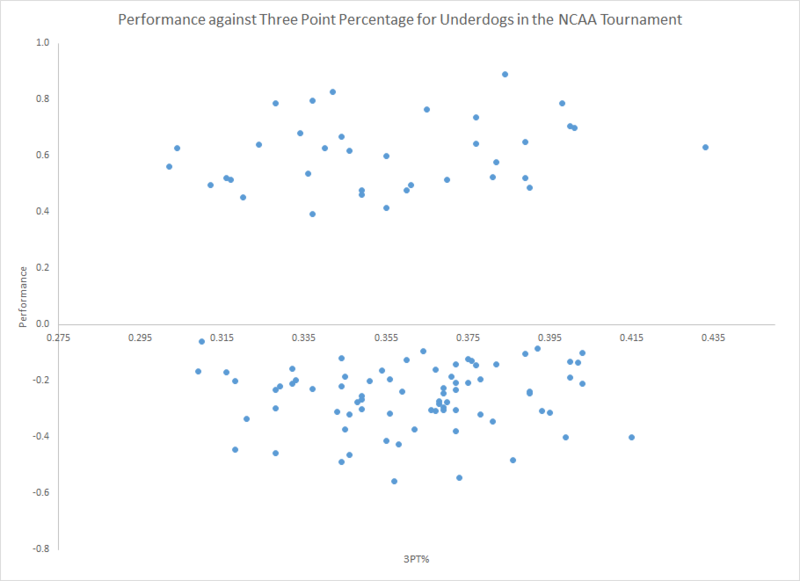 Below is plotted performance by these teams in the first round against their three point shooting percentage. The upper cloud of dots represents teams that produced upsets, and the lower cloud represents the underdogs which lost. In both groups there is no correlation between performance and high or low three point shooting percentage. Indeed, neither high nor low three point shooting is indicative of ‘bigger’ or ‘smaller’ upsets, defined by large or small positive performances respectively. The same results hold when performance is plotted against the ratio of three point attempts over total field goals, which characterizes the volume of three point attempts taken by a team. 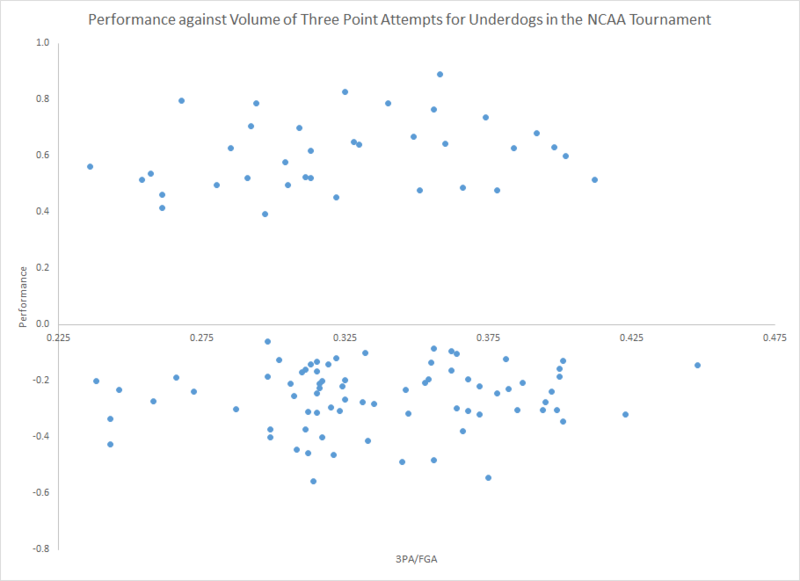 The overall correlation of performance and three point percentage was a weakly negative -0.067 and similarly a correlation of -0.086 for performance and three point volume. In general, any logistic regression I ran which contained those two facets of three point shooting returned slightly negative coefficients, indicating a higher three point volume or percentage would lower your chance of an upset, but with very large standard errors. The data by no means suggests that shooting a high volume of efficient three point shots is bad for your chance of an upset, but perhaps we should question whether typical upset teams play in that style. John Ezekowitz found that playing fast helped upsets, counter to the David tactics that a low number of possessions increases variance and hence the chance of an upset. John suggested the confounding factor that playing fast allowed small teams to compete with physically bigger favorites but perhaps the opposite is to blame here. Playing big and physical, both low volume and low efficient three point shooting traits, is also a method of producing upsets over guard-reliant favorites and could be clouding our data. Regardless, it is something to keep in mind as you pick your bracket. For every Steph Curry draining threes, there’s this. This is excellent. Fully contrarian. Makes me wonder exactly what ESPN did with their Giant Killers. Thank you for all the help so far this week. Will you release predictions from the survival model before the games start tomorrow? I have been doing statistical research on the NCAA tournament using econometric models and my data definitely backs up this research. I go back to 2006 using 516 observations and there is strong evidence to suggest that volume shooting and specifically volume three point shooting have a null if not a negative effect on the probability of winning. If you are interested my blog is at marchnormalcy.wordpress.com or you can email me at fuquac@uni.edu.